INFORMATION ABOUT THE PRINT EDITIONS: Each edition consists of 5 artist's proofs and 95 prints. Each print is signed by the artist. (By convention, giclée prints are not numbered.) The press used to print these editions can make images measuring up to a maximum of 40 inches wide and 76 inches long. The giclée prints can be made any size that is proportional to the dimensions of the original artwork, from a minimum size of 144 square inches, up to a maximum size of 3,040 square inches. 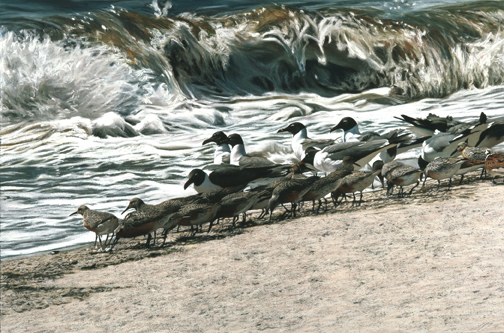 Here's an example: Ossabaw Beach (#2117), the original artwork measures 48 x 72 inches. A print could be ordered with the image measuring as small as 10 x 15 inches, or as large as 40 x 60 inches, or any proportional dimensions in between. Each print will also have a two-inch, white border on all four sides of the image. Unless otherwise requested, the artist's signature will appear in the border immediately below the bottom right-hand corner of the image. The prints are made on 19 mm thick, acid-free, Somerset Velvet paper. SHIPPING: All prints are produced on demand, packed in sturdy mailing tubes, shipped from my printer in Pennsylvania to me for signing, and then shipped by me via U.S. priority mail to anywhere in the United States. (Rush shipping is available via Fed Ex for an additional fee.) Allow two to three weeks for delivery from the date that payment is received and processed. Overseas shipments can be negotiated. PRICING: The cost of the prints (including shipping and handling) is 50 cents per square inch of image area (rounded to the nearest inch). Discounts are available with the purchase of two or more prints of either the same or different images. PAYMENT: Payments must be made by personal check or money order. HOW TO ORDER: Specify the title and # of the image you wish to order. Specify the dimensions of the image area. Calculate the cost of the print based on 50 cents per square inch. Send a check or money order to: Jon Friedman / PO Box 1050 / Truro, MA 02666. Include the address where you would like to have the print shipped, and provide your telephone number and/or email address.